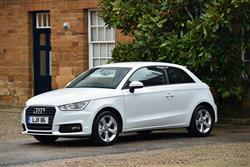 Find out everything you need to know on the new Audi A1 from independent vehicle review website Car And Driving. You can watch the video review to the left to see more of the car or read their written review below to get a true insight from an expert in the automotive industry. Audi has put its big car knowhow into a smaller one. Their improved A1 meets the fashionable need for high quality trendy compact cars with a thoroughness that will have MINI and MiTo rivals feeling distinctly worried - not least in clean, thrifty and now more powerful 1.6-litre TDI diesel guise. Audi's A1 has hit a sweet spot in the premium part of the supermini segment. This palatable dose of concentrated Vorsprung durch Technic is the brand's fastest-selling model ever, the up-market small car that Audi fans spent years waiting for, watching sporty urban trinkets like BMW's MINI and Alfa Romeo's MiTo prove just how much people were prepared to pay for something compact, yet classy. Just as the opposition were starting to catch up, the A1 has been rejuvenated with a package of changes that included a slightly smarter look, extra hi-tech equipment and, in the case of the variant we're looking at here, a little more power. That version is the mainstream diesel, a 1.6-litre TDI model that's had its output boosted from a modest 105PS to a more purposeful 116PS. Time to try it. There's no magic formula here; just sound basics from the very well developed Polo platform. That's been matched to a sophisticated range of engines. I tried what is arguably the best all-round choice as part of this test, a 1.6-litre TDI diesel with power raised from 105 to 116PS in this revised model. That's enough to see you to 62mph in 9.4s en route to 124mph. Many potential owners will be ticking the box for the optional 7-speed dual clutch S tronic transmission, one of those automatic gearboxes clever enough to select the next gear even before you've left the last one. On the move, one of the things you're likely to notice is just how sure-footed this little A1 feels powering out of sharp turns. It turns out there's a reason for this, a torque vectoring system that imperceptibly brakes your wheels at the inside of a curve. When power is applied, the excess torque then flows to the outer wheel, which helps to maximise traction and makes the car steer through the bend more precisely. What we'd council against is getting carried away by all this sporting potential and ordering your A1 with huge 17 or 18-inch wheels - or even worse, stiff sports suspension, the latter being a feature that fortunately, you can now de-select from the plusher 'Sport' and 'S line' trim levels. The A1's styling hasn't changed markedly, but you might well spot the flatter and wider singleframe grille, revised bumpers, different standard alloy wheel designs and an updated colour palette. Otherwise it's still a familiar shape with the arcing roofline that looks so good in contrast colours. The cabin adheres to typical contemporary Audi design language. If you've driven an A3 or an A4, you'll feel very much at home here, as indeed Audi has intended in order to attract customers looking to downsize. Unlike some rivals, the interior is quiet and maturely finished with no speedometers the size of dinner plates or garish graphics. Audi contend that if you're downsizing from a bigger car, you expect big car sophistication and the A1 serves that up in spades. Everything is soft touch, silicon damped and consistent in feel and design. There's now additional chrome and high gloss black detailing, new upholstery choices including an Alcantara and leather blend and new upholstery colours, such as Laser blue for Sport models. The A1 body can only afford so much interior space in a package 3954mm long, but the 267-litre boot extends to a respectable 920-litres if you drop the back seats. It's a little bigger than most city cars but is aced for space by a lot of superminis. The A1 1.6 TDI starts at around £15,500 and the top S line S tronic auto version will set you back just under £21,000. There's a premium of just over £600 if you want want to trade up from the three-door to the five-door Sportback bodystyle. As for equipment, well, even with baseline 'SE' trim, you get alloy wheels of at least 15-inches in size, plus heat-insulating glass, powered front windows and mirrors, remote locking and a Thatcham Category One alarm. Inside, you'll find air conditioning, a three-spoke sports steeering wheel and a height-adjustable driver's seat. Most importantly perhaps, there's a 6.5-inch MMI infotainment display screen from whch you can access a DAB radio, a six-speaker CD stereo system and connect in via an aux-in socket or an SD card reader. The standard safety provision runs to the usual expected things, though you have to pay extra if you want a proper spare wheel rather than one of those fiddly tyre repair kits. And you only get a hill holder clutch that stops you from drifting backwards on uphill jubnctions if you opt for the S tronic auto gearbox. All A1s do though, come with Isofix child seat fastenings, tyre pressure monitoring and twin front, side and curtain airbags. Plus there's an ESC stability control system that now has an interim 'Sport' setting that relaxes intervention a little when you're in a sporty mood. The addition of an entry-level 1.0 TFSI petrol model to the improved Audi A1 range might be enough to make some buyers think twice about stretching up to the 1.6-litre TDI diesel variant, though that does still hold a significant running cost advantage thanks to substantial improvements when it comes to fuel and CO2 returns. This version now goes around six miles further on the combined cycle, registering 80.7mpg. It's also 7g/km cleaner than before, the CO2 figure improving to 92g/km. As with the 1.0-litre model, there's a penalty of around 5% if you opt for auto transmission and, as with any car, remember that you'll take a further hit if you specify larger wheels. What else? Well as usual with Audis, low benefit-in-kind taxation ratings will be a major draw for company buyers. As will the fact that depreciation remains class-leadingly slow, which means that as long as you can afford the initial outlay and don't go mad on the options list, this A1 is probably going to work out as cheap - if not cheaper - to own than almost anything you could consider in the supermini segment. Further assistance here is provided by the affordable 'Audi Complete' service and maintenance packages that can take care of all your service and maintenance needs - and optionally your tyre needs as well - for up to three years. Plus there's a choice of either 'Long Life' or 'Fixed Inspection' servicing regimes, depending on whether you plan to cover either more than or less than 10,000 miles a year. Just how much style and luxury can you really bring to a car that's under four metres long? And exactly what happens if you distil the essence of 'Audiness' into something this small? This A1 is the answer - and a very convincing one at that, especially in this improved 1.6-litre TDI diesel guise. The German brand reckoned that this sector needed something that offered a better balance between sportiness and comfort and many potential buyers will agree with them that this car delivers it. Ground-breaking technology isn't on the agenda here, but as Audi has already discovered, there's a place for that and it probably isn't in this very price-conscious sector of the market. What's more important is that if you climb out of an expensive A4 or A6 into an A1 costing half as much, the feeling is very much the same. In essence, then, it's an expensive car with an affordable price tag. Exactly as Audi promised.